First In Math is an online platform to reinforce mathematics proficiency through the use of digital gaming and self-paced activities designed for students from kindergarten through twelfth grade. We will provide the exact instructions you need to log into your First In Math account and get started right away, as well as some tips and contact information if you should happen to have trouble with the First In Math login process. Go to the First In Math login page and click the login button in the top right corner of the page. Enter the username connected to your First In Math account in the proper field. 3. Type in your password in the field below it. 4. Click on the “GO” button in order to enter your account. Note: You can also choose to login with Clever by clicking the “Log in with Clever” button below the login credential boxes. Under the login credentials boxes, click the “I have an activation code” link. Enter the activation code in the first field. 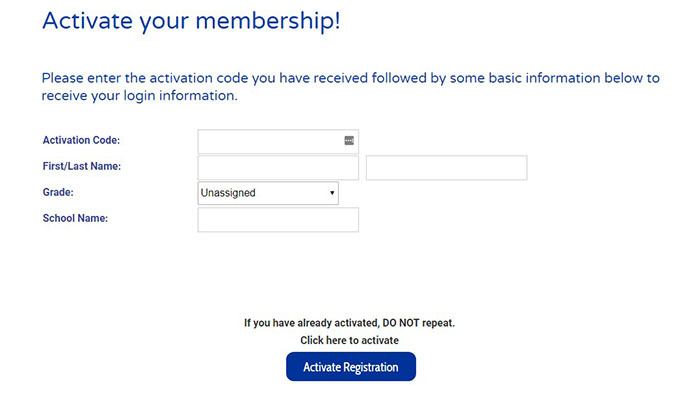 Click “Activate Registration” to activate your account. Visit www.firstinmath.com on your mobile browser. Enter your username into the first empty field. Enter your password into the second empty field. Tap “GO” to access your account. First In Math does not have a mobile app yet, so if you need to log in on the go, you will have to follow the instructions above. The two most common errors associated with the “Login Failed” message are that you’re missing the 2-digit prefix on the username ID (for example: “77mathwiz6wh”), or you have mistyped the username or password. Remember not to include any spaces in either the username or password. If you receive a licensing message when you attempt to activate your account or log in, it means that the number of licenses you or your school purchased have been used up, and no more users are being allowed on your school or individual license. You’ll need to contact the school administrator to gain access. Enter your computer’s Internet browser settings and set the cookies setting to “ALLOW” cookies. If your browser is set to “NOT ALLOW”, you will have to manually add www.firstinmath.com to your “ACCEPT” list. AOL users will probably need to switch to a browser other than AOL to access the site. First In Math Mailing Address: Suntex International Inc.
Below, we provide other useful resources and links that might be of assistance to you.